To introduce kids to Mandy's Menagerie, we suggest that you listen to the songs on the Music and Lyrics page, read the book, How It All Began, and get to know the characters by reading about them on The Menagerie page. Once your children are familiar with the world of Mandy's Menagerie, check out the Art Gallery page to see what other kids have created after hearing the music and seeing the art of Mandy's Menagerie. Since "Every living thing has a song to sing! ", what would your song say about you? Can you create some lyrics for your song? What animal in the Menagerie do you like best and why? Which character in the Menagerie is most like you? Are you shy like Kali? Mischievous like Maurice? A great friend like Sophie? Who is in your Menagerie? Who are the people/ animals/ friends that make up your family? Can you draw them? Would you like to share a drawing with us and submit it to the Mandy's Menagerie Art Gallery? 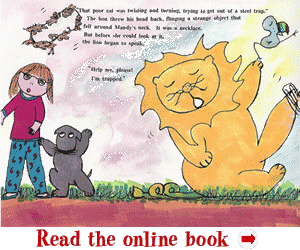 Mandy's Menagerie is instantly accessible to kids since the characters sprung from childhood art and children sing the songs. Whenever children hear the music and see the drawings, they are inspired to create their own characters and sing along with the Mandy's Menagerie songs. We believe that Mandy's Menagerie will spark the innate creativity in all children.